Hey everyone! I've got a fun summer color to show you today, but before I get to that I just wanted to share with you the link to my new Facebook page! Click here to head on over if you want like my page. You can also find the link on the right side of my blog, along with all the other social media icons. Onto the nails! Color Club Jackie OH! is my absolute favorite color for summer and looks especially good with a tan. 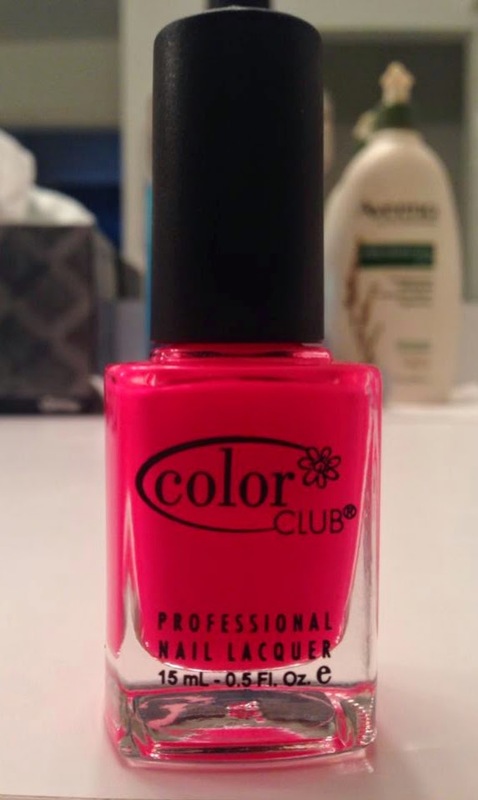 Here is the description from Color Club's website: "Guaranteed to bring out the socialite in you, this HOT pink shade will glam you up like no other!" This color is seriously hot, bordering on neon. It's actually the first nail polish that I ran out of and bought a second bottle! Here is the color I used: Color Club Jackie OH! Hey everyone! So excited to share with you my very first Deborah Lippmann polish! I actually used my Birchbox points and snatched this one up for free. This is Whip It from the 80s Rewind collection and it's almost a neon pink. The formula is amaaaaazing and I'm loving this color for summer. I can't say enough good things about it! The only negative is that a DL will set you back around $18.00 (yikes!) The color on my accent nail is Cult Cosmetics Coachella. This is meant to be a holographic topper, but I used four coats to make it opaque. I'm not very impressed with the effect. I really need to get my hands on a true holographic polish! Hey everyone! Today's post is all about Julep. 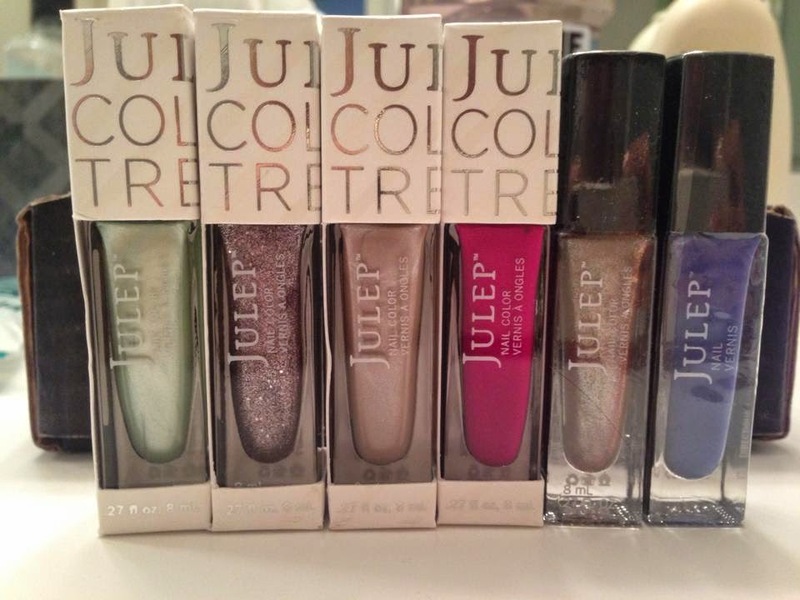 I discovered Julep about a year ago when I really started getting into nail polish. They drew me in with their free box promotion and once I tried out the nail polish I was hooked! "For new Mavens, we have two subscription tiers: My Maven and Maven Luxe. With My Maven, you'll get $40+ worth of polish & product for $24.99/month, or $19.99/month with a three-month prepaid subscription. Each monthly box is completely customizable. With Maven Luxe, you'll get $60+ worth of prestige products for $39.99/month, or $34.99/month with a three-month prepaid subscription. 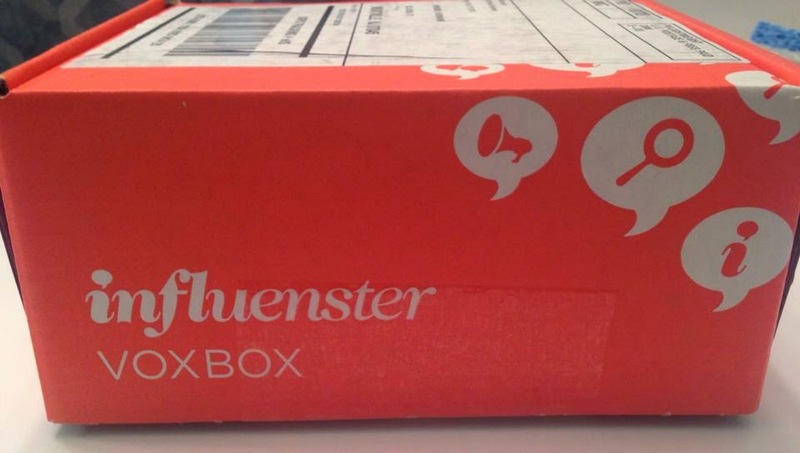 Each monthly box is completely customizable." Classic with a Twist: You're drawn to chic, elegant colors that pair well with any occasion. 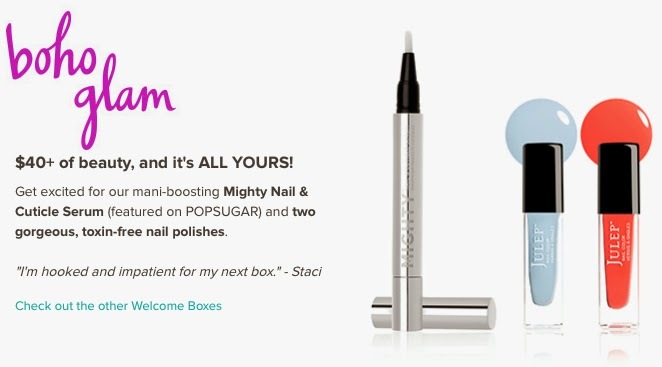 Two nail polishes & one full-size beauty product in every box. Boho Glam: You favor a mix of earthy tones and playful, vibrant colors. Two nail polishes & one full-size beauty product in every box. Modern Beauty: You're always first to try the latest, most innovative products. 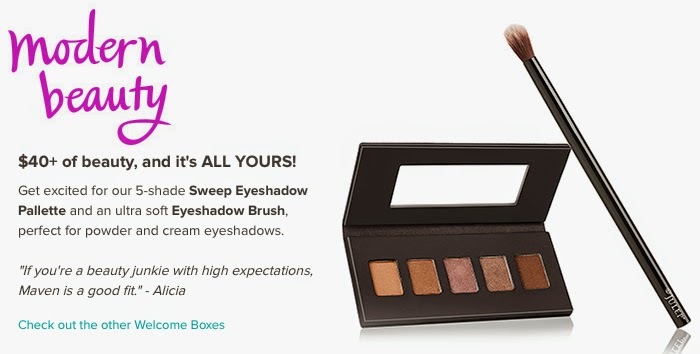 Two full-size beauty products in every box. Bombshell: You love bold, glam colors and anything that sparkles. Two nail polishes & one full-size beauty product in every box. It Girl: You're into cutting-edge colors and finishes that make a statement. Three nail polishes in every box. Once you've selected your style profile, head over to the checkout and enter the promo code "FREEBOX" to deduct $24.99 from your order. You just have to pay $2.99 for shipping. Unfortunately new Mavens may only skip their box twice a year, but you certainly could cancel your account (by phone only) and have it reactivated at any time. You can also send your box to a friend! Julep does say in their FAQ that they will do their best to help you out if you have an extenuating circumstance and must skip your box. 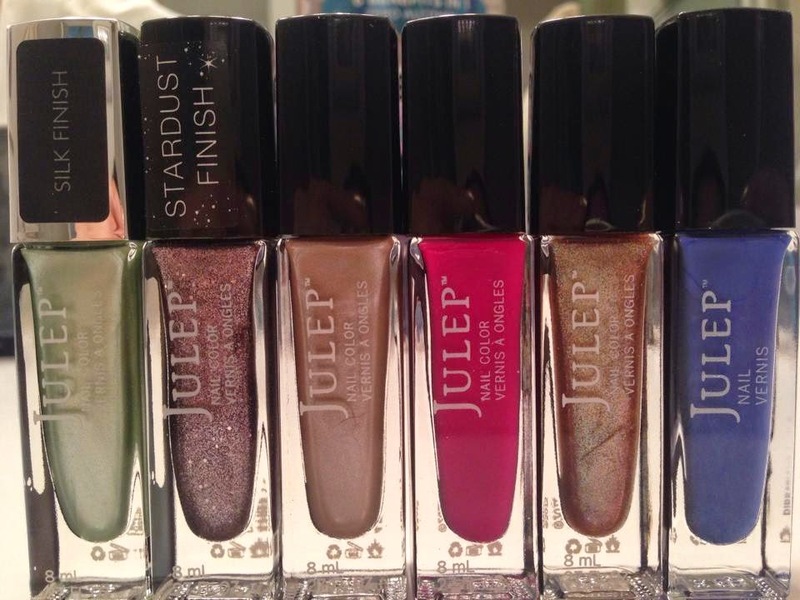 I have contacted Julep customer service several times and was very happy with my experiences. I hope this helps anyone who was thinking of trying Julep. 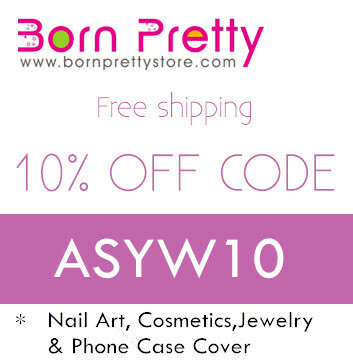 I definitely think it's a great subscription program for nail polish lovers who want to try new colors and build their collection. It is also a great option for a unique gift for friends/family. 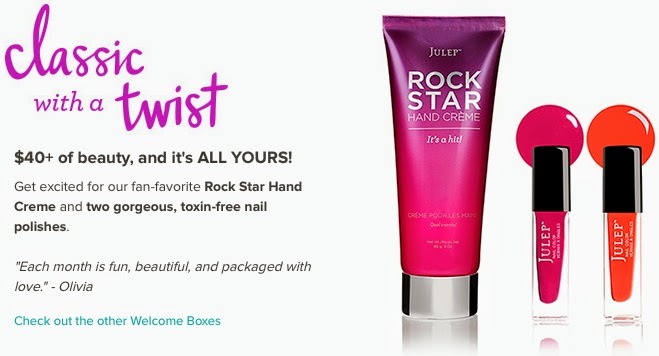 If you're interested in trying Julep, you can click here and it will take you straight to your profile quiz! Disclaimer: I am not affiliated with Julep in any way. All products were purchased with my own money and all views are my own. This post does contain referral links. You don't have to use them, but I would appreciate it if you did! Julep Red Marker Sale Haul! Hey everyone! I got my little haul in the mail today from Julep's Red Marker Sale. About two weeks ago Julep had their semi-annual Red Marker Sale, up to 85% off. That brought some polish down to $2! In my next post I'll tell you all about Julep and how you can get your first box for free (just pay shipping). Now for the goodies! My new pretties all wrapped up! And here they are unwrapped looking oh so lovely! 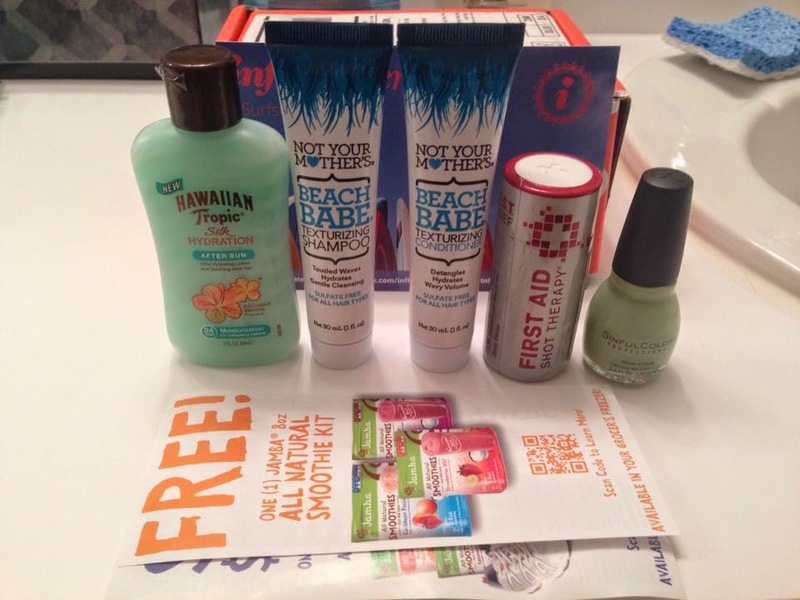 Influenster - Surf's Up VoxBox! And here is what was inside! Those two coupons in the front are for the Jamba Juice Smoothie Kits, valued at $2.99-$3.49. One coupon gets you a free kit and the other is for $1.00 off. I'm a smoothie gal myself so I'm looking forward to trying this! From left to right, the first product is the Hawaiian Tropic Silk Hydration After Sun in the scent coconut papaya. I received 2oz, valued at $2.99. The 8oz bottle is $8.99. It smells amazing and I'm excited to try this after laying out in the sun instead of my usual aloe. The next two products are Not Your Mother's Beach Babe Texturizing Shampoo/Conditioner. These travel sized tubes are valued at $3.00 each and the full size is valued at $6.00 each. I have the NYM Beach Babe Texturizing Sea Salt Spray and I absolutely love it, so I have a feeling I'm going to love this product just as much! It also smells like coconuts and the ocean, yum! Next is First Aid Shot Therapy, valued at $2.99. This is an FDA compliant liquid pain relief drinkable shot. The information card says the common uses for this product are headache, sore muscles, back pain, and hangover headache. Hmm...I have a wedding coming up in a couple weeks. I might need to try this guy out after spending the night at the open bar haha! The last product I received is a Sinful Colors nail polish in Song of Summer (love that name!) valued at $1.99. I definitely don't own any colors like this so I'm happy to have something different to add to my collection. Hey everyone! 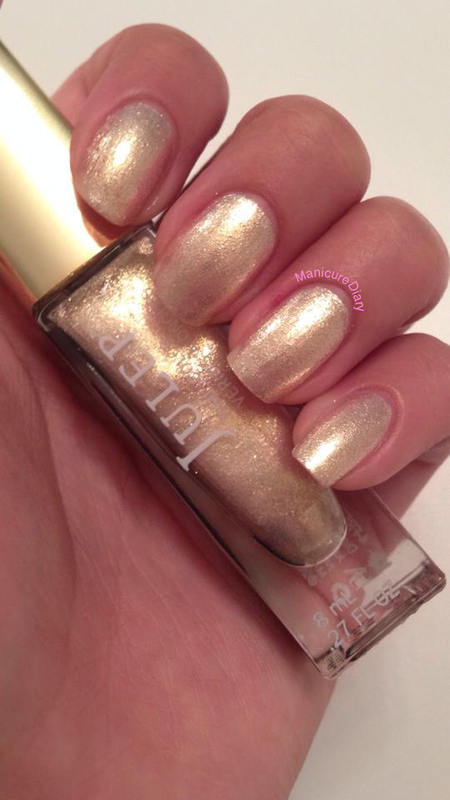 I have a gorgeous mani to share with you today. I used Julep Kathy, which is one of their Birthstone polishes. I'm collecting all 12! As described on Julep's website, "this pearl birthstone shimmer is the magnificent June gem in our gold-capped Birthstone Collection." The formula is a little on the thick side, which has been the case with all of the Birthstone polishes so far, but it's not too bad to work with. This color is so beautiful, pictures do not do it justice! Hey everyone! I have a quick mani to share tonight. I stopped at Ulta a few days ago and they were running a deal with Zoya polish, buy two get one free! I've been wanting to add more Zoya polishes to my collection because I absolutely love the formula. I picked up Dot, Monet, and Lux, which is a textured PixieDust. For this manicure I used Dot with Monet on my ring finger nails. 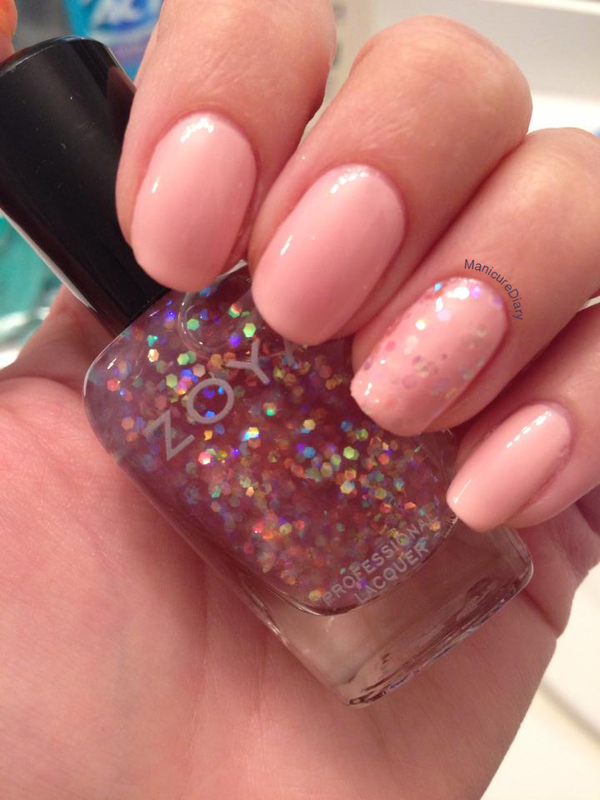 As described on Zoya's website, "Dot by Zoya can be best described as a full-coverage pink petal cream. 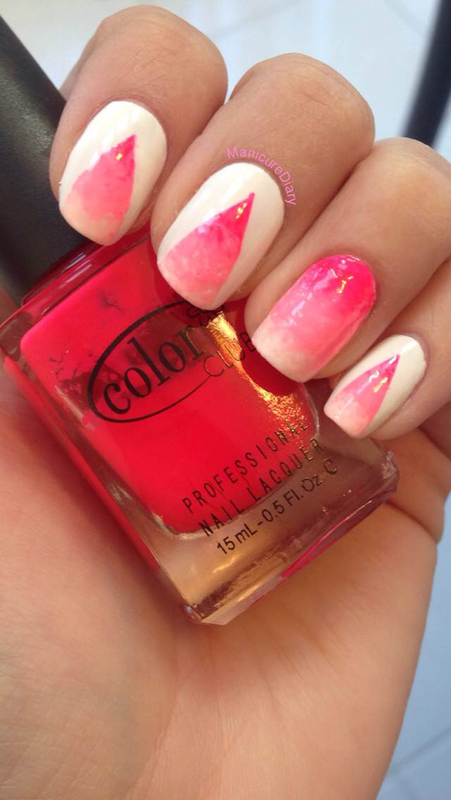 Top with 1-2 coats of special effect topper, Zoya Monet, for a fun accent!" I actually paired Monet with Dot not knowing that Zoya recommended it! I love how it turned out. The picture does not do Monet justice! Here are the colors I used. 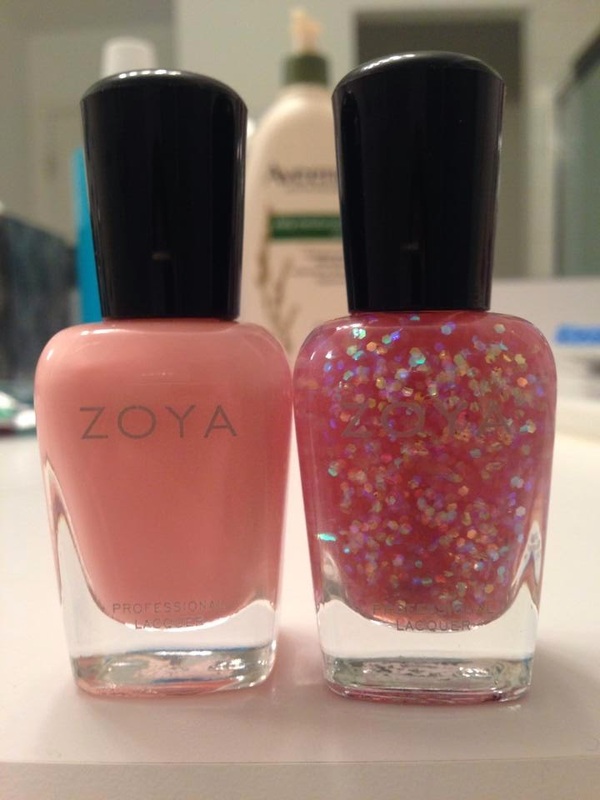 From left to right: Zoya Dot and Zoya Monet. Hey everyone! This post is kind of a continuation of my previous post, Nail Prep 101. One of my friends was asking me for tips on doing a manicure at home, and I thought the best way to help her was to come over and show her! We went out to the store and picked up supplies and a whole bunch of polishes. We brought our haul back and I used all the steps to give her an at home manicure! Keep reading to see how it turned out. All of the pretties we picked out! The base and top coat I chose for her. After filing her nails (her mom joined us and did the filing!) she soaked her hands in warm water to soften up her cuticles. You could also push back your cuticles after showering. After soaking her hands I showed her how to push back her cuticles and then I buffed her nails. Before applying the base coat I had her swipe her nails with remover to get rid of any excess oil. Next I applied the base coat, Orly Nail Defense, and showed her how to get a nice thin coat and how to wrap the tips of her nails. 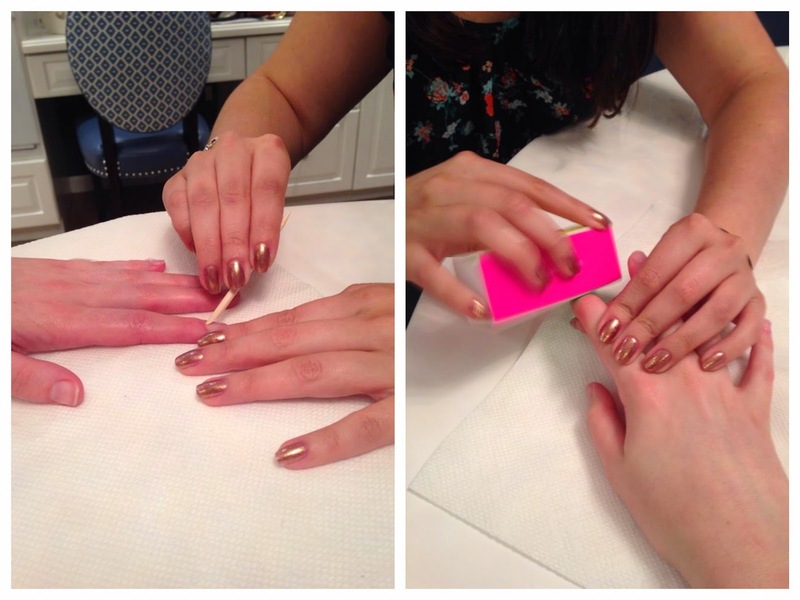 Remember to wrap your tips with the base, the color, and the top coat! Once that dried I applied two thin, even coats of Essie Play Date with Milani Twinkle on her ring finger nails. Lastly I applied my favorite top coat, Sally Hansen Insta-Dri. I love how they came out! I hope Nail Prep 101 and this follow up tutorial were helpful. Next time you want to get a manicure, try doing it yourself at home! You'll be amazed at how beautiful it turns out if you follow all of the steps. Hey everyone! Today I'm sharing with you my current nail care/prep routine. A lot of people ask me how I make my manicures last for so long (We're talking anywhere from four days to over a week!) 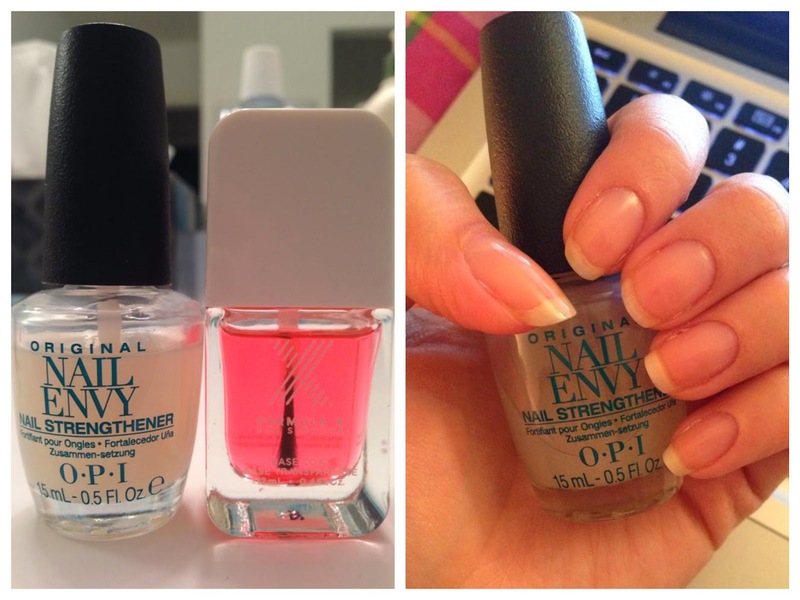 Here are the steps I use and recommend for achieving long lasting manicures! Step one: Remove your nail polish if you are wearing any. I have been loving Zoya Remove lately! Step two: Cut your nails if desired. I skipped this today because I'm happy with my current length. When you cut your nails don't feel obligated to make the shape square like they do at the salon. I actually prefer the squoval shape. Dare yourself to try something new! Step three: File your nails. For this I strongly recommend using a glass nail file and ALWAYS file in one direction! This will prevent any jagged edges. I started using a glass file from Sephora a few weeks ago and I have seen an amazing improvement in the strength of my nails. Plus you can rinse these files under warm water and they're as good as new! Step four: Use an orange stick, or some other sort of cuticle pusher, and gently push back your cuticles and clean under your nails. If your cuticles need a little encouragement, soak your hands in warm water to soften them up. DO NOT cut your cuticles! They are there for a reason, which is to protect you from all sorts of bacteria that can lead to infection. I pick these up from the drugstore for a couple bucks and they work great! Step five: Buff your nails. I have one of these four step buffers that tell you the order to go in. The first step is always file, and we've already done that with our glass file. The second step helps to smooth out ridges in your nails. 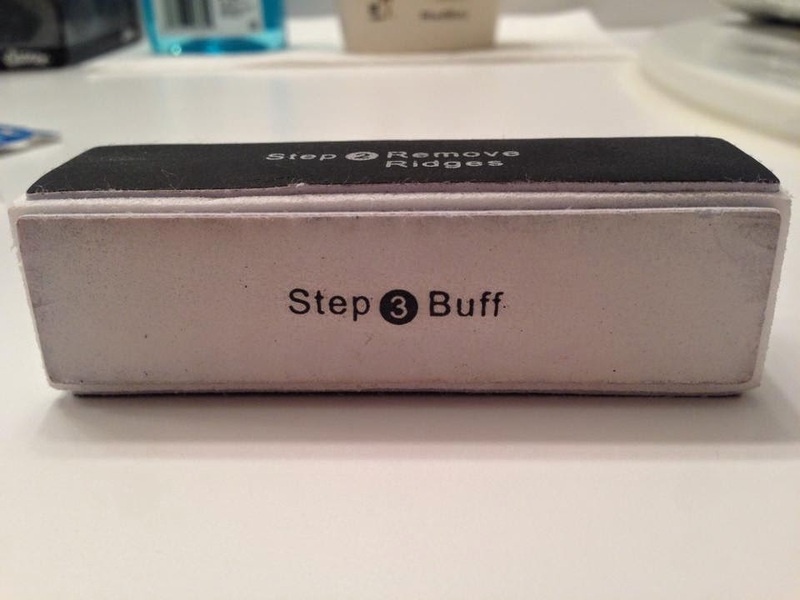 The third step is buffing even further. For both of these steps use a gentle side-to-side motion on your nails. The final step is to polish and shine. If you really take the time to do this your nails will look like you've just put on a coat of clear polish! This is a great tool for those of you who may not be able to wear any polish for work or other reasons, but still want your nails to look fresh and healthy. Step six: Swipe your nails one last time with nail polish remover to remove any excess oil and then apply your base coat. I have naturally weak nails, so for the past couple of months I've been using OPI Nail Envy and it has really worked wonders on my nails. Lately I've been switching back and forth between that and the Formula X for Sephora base. Sometimes I like to take a break from using polish so I'll just apply two coats of Nail Envy and reapply every other day for a week. If I'm applying color, as I did today, I just use one coat of my base and make sure to wrap my tips. This means that I apply a thin layer of the base coat to my nail and then run the brush along the tip and a little bit underneath the nail. 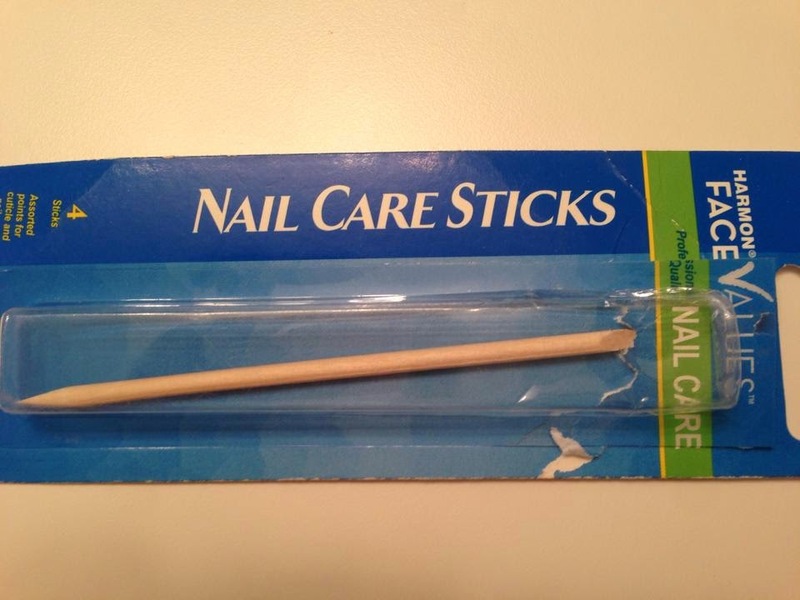 This greatly increases the wear time of your manicure! Step seven: Apply polish of your choice. 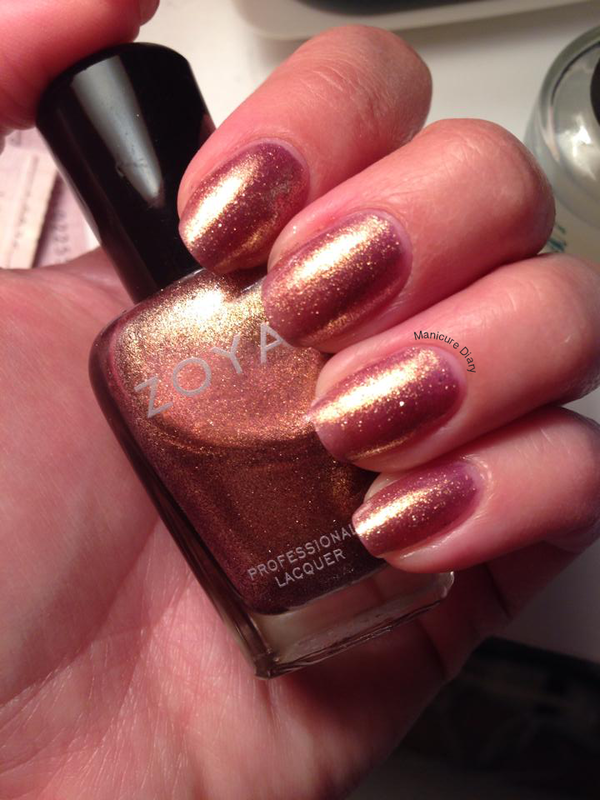 For my mani I chose Zoya Faye, which is described by Zoya's website as "a bronzed mauve with purple and brown undertones flooded with bright gold sparkle." This color is absolutely gorgeous and can be worn in any season. This is one of those .colors that looks just as beautiful on your nails as it does in the bottle! I used two thin coats of this, making sure to wrap the tips of my nails on the first coat. Make sure you let the first coat dry before putting on the second. Step seven and a half: I consider this to be half a step because not everyone will need to do a lot of clean up, but I admit that sometimes I do get polish on my cuticles when using my non-dominant hand. Taking a little extra time to clean up your cuticles will make your manicure look professional. I use a combination of q-tips and this $1 concealer brush from elf. I just dip it in nail polish remover and carefully clean around my cuticles. Step eight: Apply your top coat once your color has dried completely. I have searched for a long time for the perfect top coat and found my HG (holy grail) a few months ago. 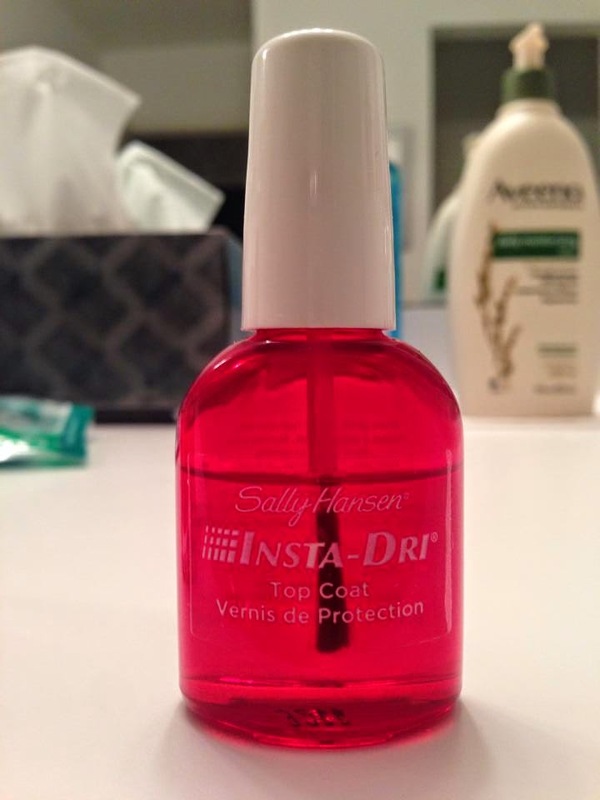 It is the Sally Hansen Insta-Dri and at around $4.00 per bottle I will be buying this stuff again and again. Once again make sure you wrap the tips of each nail as you apply your top coat. Step nine (going the extra mile): Cuticle oil/cream & hand cream. This step is completely optional, but if you're like me and your cuticles tend to get dried out or you get hang nails (especially in the winter) I suggest you give this step a try. I always put on cuticle oil after my manicure has dried because my cuticles usually get dried out from the nail polish remover. I also like to use the cuticle cream or oil before bed. I take the time to massage it in because it improves circulation and actually stimulates healthy new nail growth! 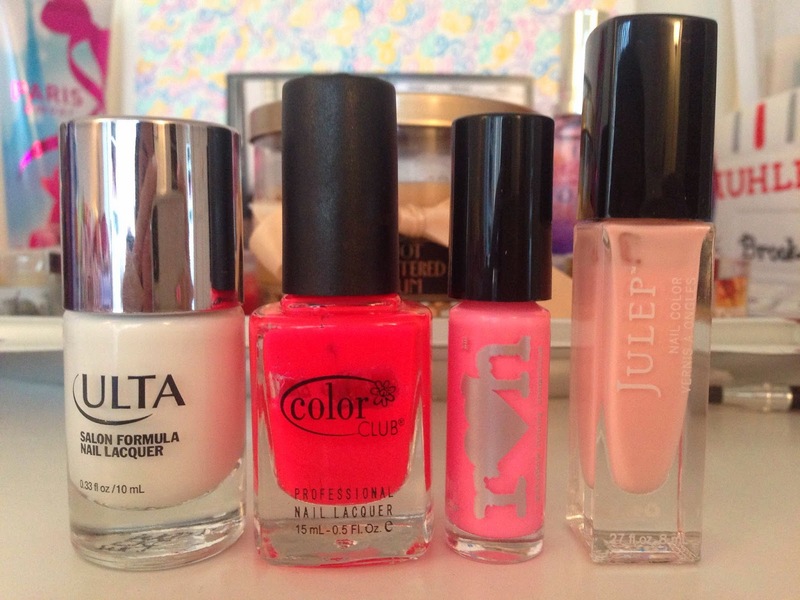 I like to use Julep Essential Cuticle Oil, Rainbow Honey Cuticle Oil, or Sally Hansen Cuticle Eraser & Balm. I also use hand cream constantly to keep my skin hydrated! 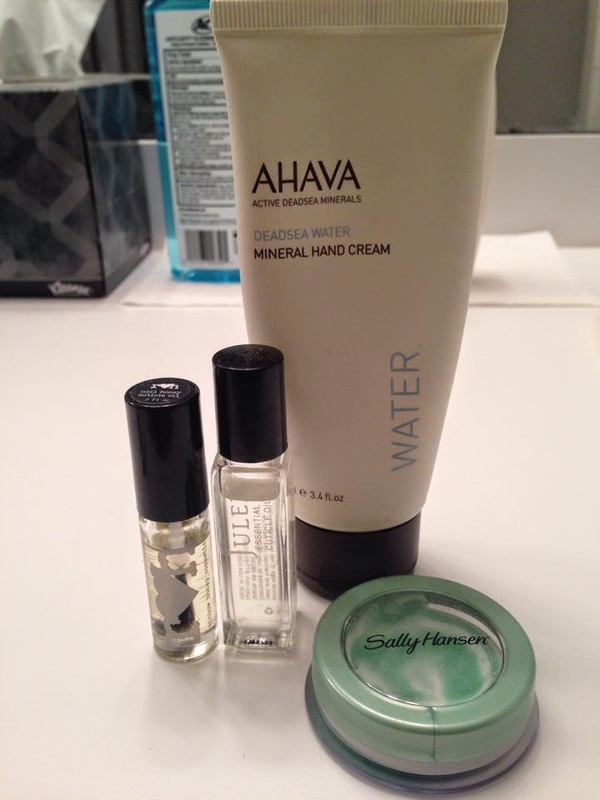 My all time favorite is the Ahava Deadsea Water Mineral Hand Cream. 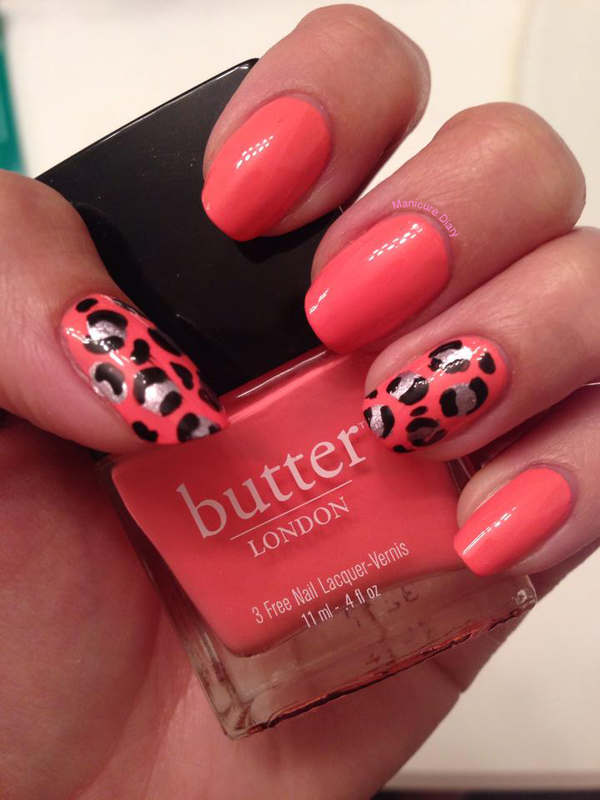 Coral & Leopard Print: Meow! Hey everyone! Today's mani is super fun for summer and you won't believe how easy it is! A lot of people, myself included, see leopard print and think, "That is WAY too hard!" Trust me, it is not as difficult as you think! Keep reading to see how I achieved this look. Here are the colors I used. 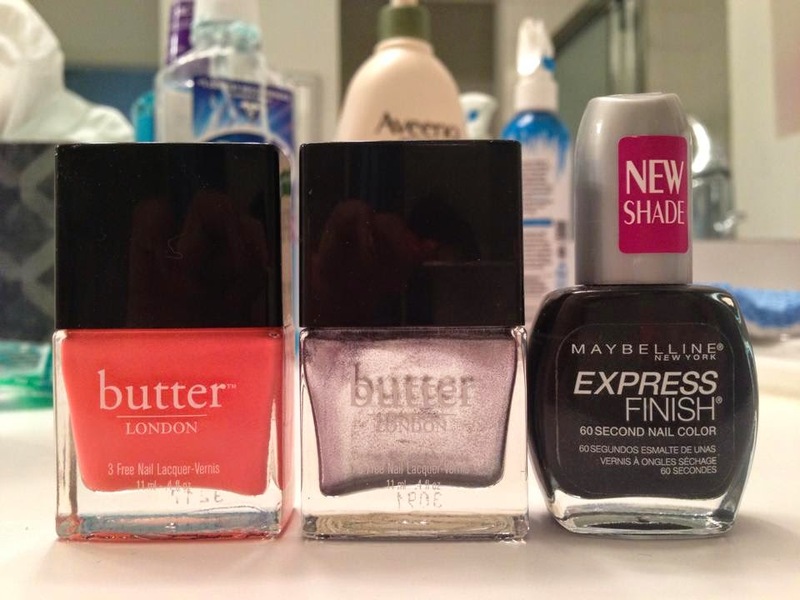 From left to right: Butter London Trout Pout, Butter London Lillibet's Jubilee, and Maybelline Onyx Rush. First you start with two coats of the color of your choice after applying your base. For mine I used Butter London Trout Pout (love that name!) It's really important that you let your nails dry completely so the pattern goes on smoothly. Next, pick the color for your spots. Have fun with it! For mine I used Butter London Lillibet's Jubilee. Get a piece of foil or wax paper and put a few drops of your polish on it. Now you'll need some sort of dotting tool. 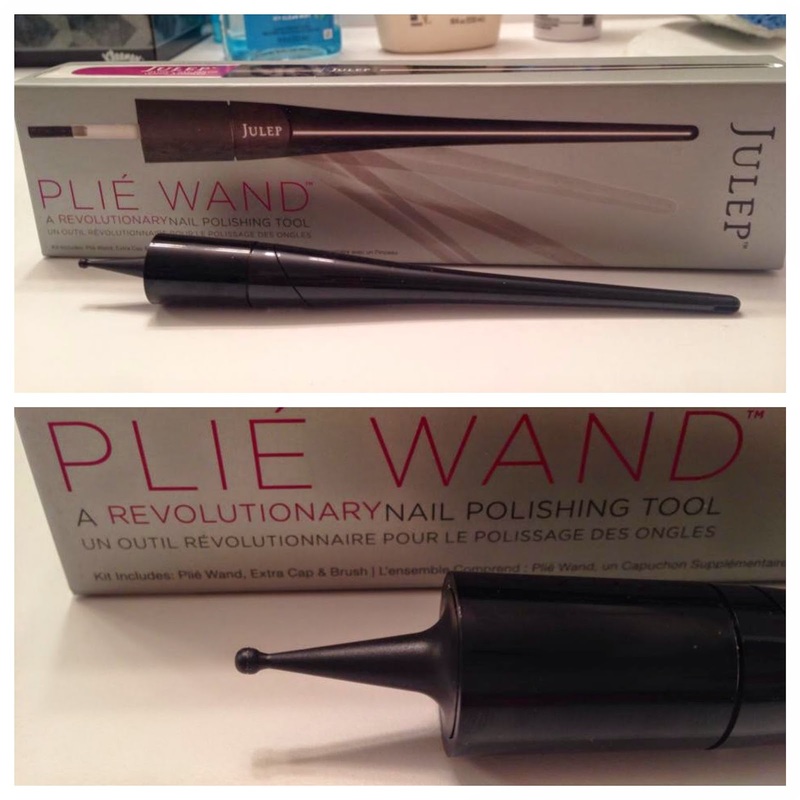 I have Julep's Plié Wand with the dotting tool attachment, but you can just use a toothpick or even a bobby pin. Dip your tool into the polish and place blobs all over your nail. We're not going for polka dots, so it doesn't have to be perfect! Once your spots are dry, take a black nail polish and put a few drops on your foil or wax paper. For this part I suggest a small detail brush, a black nail art striper, or one of those nifty nail art pens. If you can't find any of those you could use a toothpick and it will still come out great! Dip your tool in the black polish and draw some curved lines around the blobs. Get creative! Once you've done that you can fill in any empty spaces with some black dots and lines. Before you put on the top coat, make sure you let your design dry for a while so you don't get any smudging. And that's it! I hope you come up with some fun leopard print combinations for your next mani! Hey everyone! Today I have a quick review for you. I recently purchased the Zoya Remove Plus 3-in-1 Formula in the spill proof 8oz Big Flipper pump container after hearing so many rave reviews about it. "Zoya Remove Plus is an award winning, gentle, yet highly effective 3-in-1 nail polish remover, nail prep and nail conditioner. Longer nail polish wear starts with Remove Plus." I first received the smaller 2oz size as a free sample (retail $4.60) and really liked using it so I took advantage of a 20% off coupon from Ulta and bought the 8oz Big Flipper pump container. It's a little pricey at $10, but I figure when it's empty I can refill it with my usual drugstore remover. If you really love it you can get a 32oz refill bottle for $25. The pump container is great! No more pouring remover into the lid and making a mess. I just take my cotton ball and press it over the pump. Upon opening the remover you get a lavender scent, although you can definitely still smell the chemicals. It's not as strong as a drugstore remover, but I certainly would not recommend sniffing it! 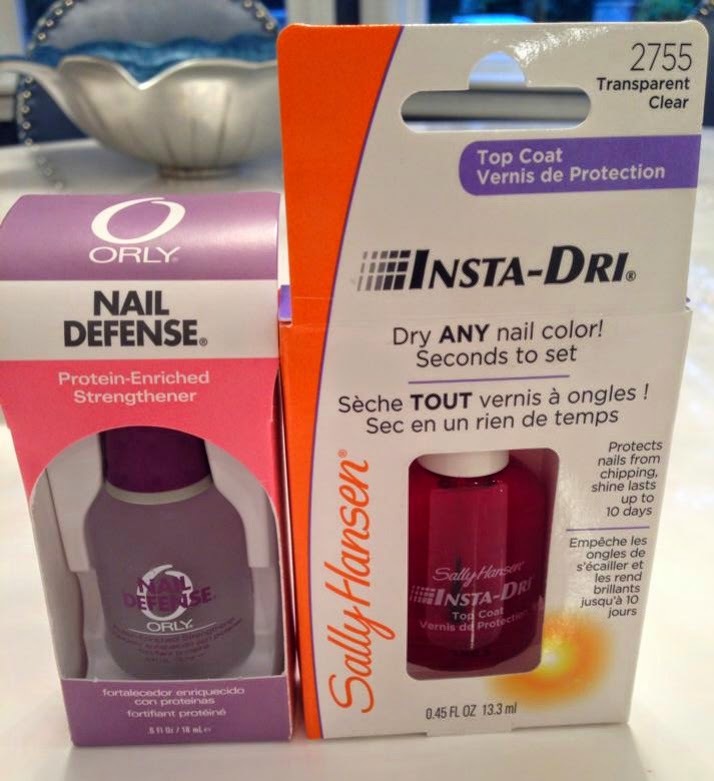 This stuff worked super quickly to remove all of my polish in just a few swipes for each nail! It provided a great base for my base coat and it does not dry my nails out like the drugstore brands sometimes do. If you're looking to try a less harsh nail polish remover that is still effective I think Zoya Remove Plus is a great option for you! Hey everyone! In honor of it being June 1st, I did a bright and fun summer mani. It really got me in the mood for a beach day! This was my first time trying gradient nails and I'm pretty happy with how it turned out. To get crisp lines I just used tape, but make sure your base color is completely dry first! You'll also want to remove the tape while the gradient polish you put on is still wet. I used an art sponge instead of a cosmetic sponge, since that was all I had, and I'm wondering if using a cosmetic sponge would make it look less bumpy. Here are all of the colors I used. From left to right: Ulta Snow White, Color Club Jackie Oh, Rainbow Honey Cameo 18, and Julep Jules.